A diabetic woman has become the first in the world to give birth naturally after using an artificial pancreas while pregnant, experts have said. 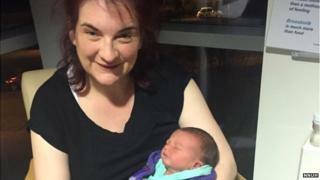 Catriona Finlayson-Wilkins, 41, of Knapton, Norfolk, gave birth to son Euan on Tuesday at the Norfolk and Norfolk University Hospital. She is also the first woman to give birth after using the device outside the main research site in Cambridge. Ms Finlayson-Wilkins said she was "thrilled" by her son's safe arrival. The new mother-of-two has Type 1 diabetes and wore the piece of kit throughout her pregnancy to produce insulin and prevent symptoms of the disease. Three other mothers have previously given birth in Cambridge after using the device but by caesarean section. An artificial pancreas device system (APDS) is a small portable piece of equipment designed to carry out the function of a healthy pancreas. It helps to control blood glucose levels using digital communication technology to automate insulin delivery. An APDS is worn on the body during pregnancy and has a continuous glucose monitor (CGM), a digital controller and an insulin pump. Ms Finlayson-Wilkins, who is a face and body painter and has also decorated models for local charity Break's GoGo gorilla and dragon art trails, said: "I'm thrilled. "It's a huge weight off your mind after being pregnant and diabetic, which is really risky. "It's the most amazing piece of kit and I can really see how it's going to benefit all types of people with diabetes in the future." Her first son was taken into intensive care when he was born because his blood sugar levels dropped dangerously low and she did not see him for a day. Dr Helen Murphy, principal investigator of the study Ms Finlayson-Wilkins took part in, said Euan's arrival was an exciting step in the treatment of diabetes in pregnancy. "Women who have diabetes in pregnancy face higher rates of birth defects, over-sized babies, pre-term delivery and stillbirth than other pregnant women," she said. "Treating diabetes in pregnancy can be particularly challenging because hormone levels are constantly changing and blood sugars can be difficult to predict." The results of the ongoing National Institute for Health Research's Closed Loop in Pregnancy study are due to be published later this year. Its findings could mean the technology benefits more pregnant women with diabetes.